Hi ya'll. I bought a used 2004 Volvo xc70 for $500. Head gasket was blown. Took it to a machine shop turns out the warpage is more than can be fixed so i bought a used head in great condition and had the valves rebuilt as well. when it arrived back to me both cams were off and the variable timing hubs were loose. So I am wondering if anyone here knows of some resources for setting up a xc70's timing from total scratch with everything out and loose? Thanks in advance for your help. Last edited by Fataqui; 03-21-2017 at 11:24 PM. hi F! thanks for the long detailed explanation. I purchased one of those locking devices and it just arrived today. I just wanted to be clear: the car's head is out, valve cover is off. Also, This car did not come with a timing belt cover. So i don't know if the timing covers are straight up and down like some or if they are angled. by what you described is it correct then that the part number of the rear of the intake cam will be on the bottom of the seam and thus on top of the seam for the exhaust cam? I am waiting on the water pump and new belt assembly to arrive. When it does next week, i'll get right on it. Thanks again. You need a rear cam locking tool. 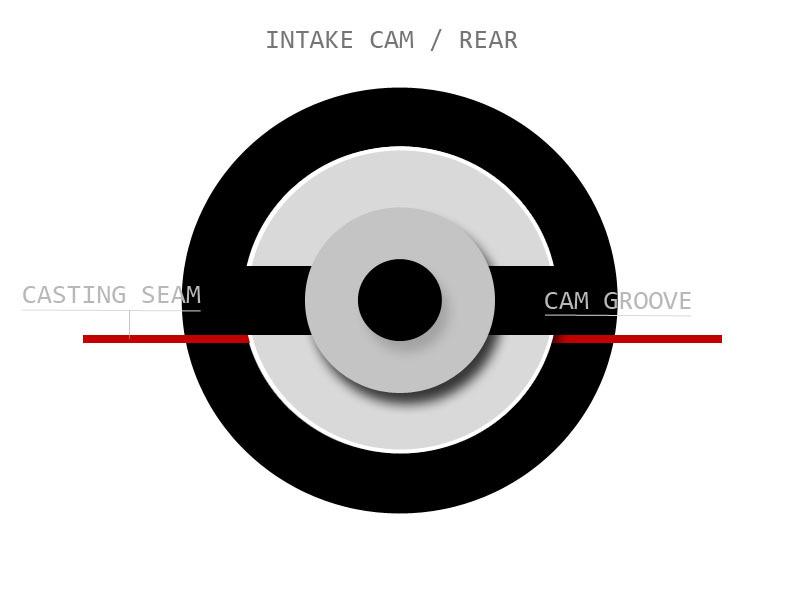 Set the rear intake cam grove to be above the head seam, (the lower edge of the intake cam grove should be inline with the heads seam). 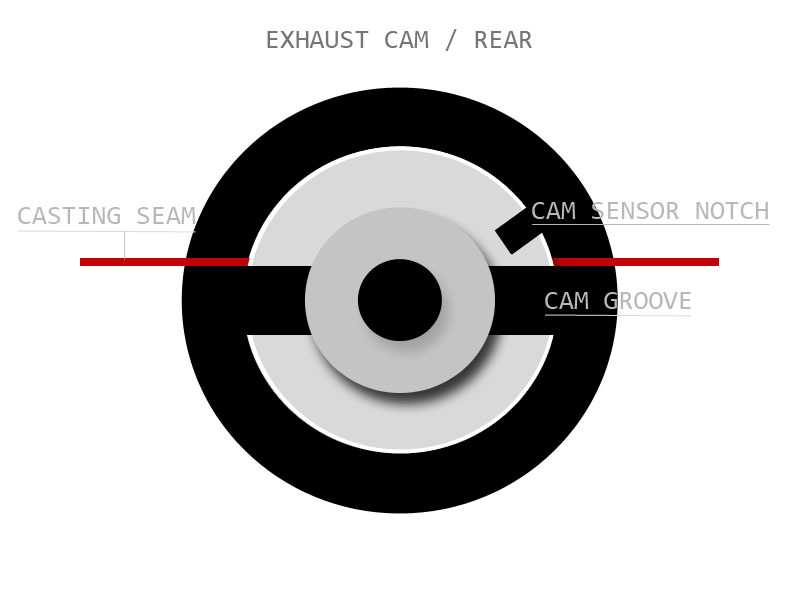 Set the rear exhaust cam grove below the head seam, (the upper edge of the exhaust cam grove should be inline with the heads seam). Can you please clarify this? what you wrote says both front and rear, intake and exhaust marks are facing below. Which one is up and which one is below? The part came in early. The exhaust cam groove should be below its casting seam, but the top edge of the exhaust cam groove should also run parallel with its casting seam. The intake cam groove is exactly the opposite, The intake cam groove should be above its casting seam, but the bottom edge of the intake cam groove should also run parallel with its casting seam. After you have those set, you can then lock your cams. To explain this... If you look at your locking tool, you will notice the male cam groove inserts are offset, the exhaust male cam insert is offset towards the bottom of the exhaust cam center, and the intake male cam insert is offset towards the top of the intake cam center. just seeing that on your locking tool should tell you that the exhaust cam groove goes below its casting seam, and the intake cam groove goes above its casting seam. In other words the locking tool will not line up with each cams groove if you don't have the cams timing setup positioned properly! Last edited by Fataqui; 03-25-2017 at 02:41 AM. Can I set timing on an 89 240?